Plitvice Lakes National Park comprises 16 lakes that are known for their scenic beauty and distinctive colours, ranging from azure to green, grey or blue. The Plitvice Lakes lie in a basin of karstic rock, mainly dolomite and limestone, which has given rise to their most distinctive feature. The lakes are separated by natural dams of travertine, which is deposited by the action of moss, algae and bacteria. The colours change constantly depending on the quantity of minerals or organisms in the water and the angle of sunlight. 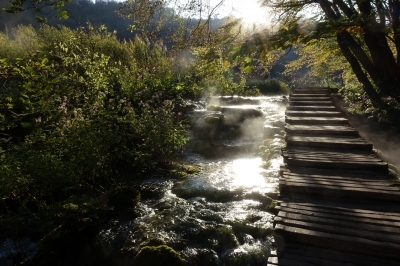 The site has been on the World Heritage List in Danger from 1992-1997, as a result of the so-called 'Plitvice Lakes Incident' and its consequences, which in March 1991 was the start of bloody Croatian War of Independence and Freedom. Plitvice Lakes National Park already became a World Heritage Site in 1979. It was among 6 sites from Yugoslavia that were inscribed that year, sites which now lie in 4 different countries (the others were Ohrid, Kotor, Split, Stari Ras and Dubrovnik). Plitvice is one of those ‘golden oldie’ Eastern European tourist destinations, like the Wieliczka Salt Mine or the Postojna Caves. One wonders if there comes a time when nobody will go there anymore. But it still attracts over one million visitors a year. 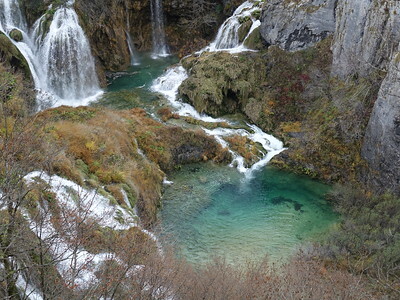 I visited in early November - so what is Plitvice like out of season? I had stayed overnight in a town nearby, which allowed me to be present at the Lakes at 8.30 a.m. A November trip proved to be rewarding financially rightaway: no parking fee is required at this time of year, and the cost of an entrance ticket is cut in half to 55 kuna (about 7.30 EUR). This gives unlimited access to the various park entrances for one day, plus free transportation on the ferry across the largest lake and the shuttle buses. Quite good value I think. The park has two main entrances. I first drove to Entrance 2 (which lies somewhat half way the Upper and Lower Lakes). This parking lot turned out to be closed, so I returned to Entrance 1. While in summer queues of an hour or more are not unheard of, the only other visitors this morning fitted in the one bus and some 10 cars that were at the parking. From Entrance 1 it’s only a short walk to the highlight of Plitvice: the big waterfall and its associated travertine pools. If you have only one hour to spend at the park, I would suggest to take Entrance 1 and make a short dash down to this spectacular section. From the viewpoint it looks like a rather complex jigsaw puzzle. It includes a system of waterfalls and pools, crossected by a boardwalk. The disadvantage of starting at Entrance 1 is that the rest of the park isn’t as spectacular. Mind you - it is still interesting enough and one can spend easily 4-5 hours hiking the trails. I did a combination of hike C and K: K is the only circuit that can be done fully on foot, while all the others involve some form of park transport. I did take the ferry across the main lake – I believe I had read beforehand that it doesn’t run in the low season, but it does (once an hour). The cafeteria near the dock was open too. There were some 60 people aboard, including a large group of Asian tourists. The latter stayed on board until stop P1, so their tour skipped the Upper Lakes which are accessible from stop P2. I hiked all the way up, along the smaller waterfalls that feed the Upper Lakes. Trails all around the lakes are well-maintained and easy to navigate. Near the top lies a shuttle stop, where I hopped on a tourist train-like vehicle to take me down to the middle section again. By that time it was around 12.30, and there were many more people around than earlier in the morning. Most visitors seem to come in groups – Asians, but also locals from maybe Zagreb or other cities nearby. This first Saturday in November was blessed with dry and fairly mild weather. Scenery wise it would probably have been better to visit a week or two earlier to enjoy the fall foliage – almost all trees had lost their leaves by now. But it was a pleasure to walk around relaxed, the many boardwalks are no fun when there are droves of people crossing or stopping to take yet another selfie. The Plitvice Lakes are an undisputed WHS, although I found the scenery fairly similar to Jiuzhaigou (which is bigger and has higher mountains – IUCN also stated in Jiuzhaigou’s evaluation that its “landscape attractions exceed those of … Plitvice Lakes WHS”). Plitvice Lakes is undeniably beautiful and the National Park is well managed—both things that would usually earn this five stars, but it's just too popular to be as enjoyable as it could have been. The park uses an elaborate system of boardwalks to lead tourists through the lakes and waterfalls all throughout the area, which means everyone is on virtually the same set path through the park. And if you happen to arrive when a few of the huge tour buses do too, then it can be intense. But on my first visit I didn't realize that there are hiking paths beyond the 2-3 hour one that most people take—if you have a day you can spend as many as 8 hours hiking through the park, and you would find far fewer people on those other routes, as well as a chance at spotting some of the unique wildlife. That said, even though more than 10,000 people visit on a high season day, the 16 terraced lakes are magnificently pretty. I've seen a lot of places in Europe, and Plitvice surprised me—yes, a place like this actually exists in Europe! The water changes hues of aqua and green as you progress through the landscape and if it's a sunny day the sparkling colors are just breathtaking. Although some people whip through the park quickly, there are some surprises if you take it slowly and exhaust the many paths, taking the 4+ hour twists and turns instead, which include the boat ride to the larger lake. It's absolutely a must visit site, but it's a highly touristed one even if many Americans haven't heard of it—locals and Europeans are absolutely already visiting this pretty Croatian National Park. Read more from Shannon O'Donnell here. It was 6:40h in the morning in Karlovac and I was boarding the bus to Plitvice NP. I had assumed that primarily locals would be on a bus this early, but I was mistaken. Indeed, plenty of Asian travellers had boarded the bus at 6:00h back in Zagreb. That's when I knew that this was a popular site. We arrived around 8:00h and exited the bus at Entry 1. Directly behind the entry there is a viewpoint with a nice view of the largest waterfall of the park. Arriving this early had the benefit of mist still covering the lakes and canyon. It looked mystical. I should have brought a dark filter and a tripod for my camera. There are several hikes in the park. I started with Trail A, but was a bit befuddled when I didn't see the glorious cascades. So I hurried all across park to get to Entry 2 hoping to see them there, but no. Clyde in our whatsapp group eventually resolved the mystery: Water levels in autumn were really low, so the cascades were not as impressive as they could have been. Due to bad bus schedules and me having to travel back to Pula I only had 2h on site. While this is enough for Trail A, I would have preferred some more hours to see a bit more. 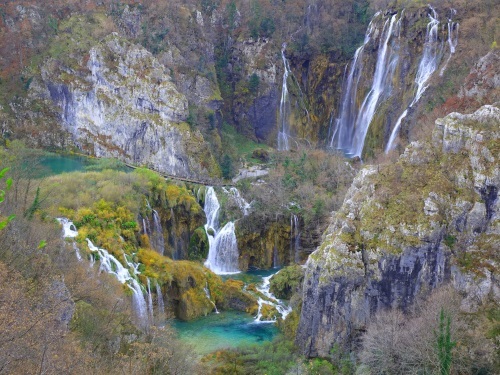 Plitvice is Croatia's most popular tourist site. As such I assume that you will be able to book plenty of tours from the main tourist centers. In high season. If you are travelling late like me, i.e. in shoulder season (October) and if you are coming from the North Western corner of Croatia (Istria( your options are far more limited. To get to Plitvice from Porec I traveled to Karlovac the previous night. From Karlovac there are several daily busses to Plitvice. Unfortunately, the available return busses were not well timed, so I ended up with only two hours on site. I would recommend taking the early bus at 6:40h. After returning to Karlovac I traveled back to Istria (Pula, 4h). Other connections from Plitvice are Zagreb and Zadar/Split. I have found the online information for Croatian busses to be of limited use, so check multiple sites. Best info I got was from Arriva. Also note that Croatian busses fill up quickly and do not run as frequently as you would want them to. So reservations are mandatory. I had to spend a night and some hours waiting on my bus ride back to Pula in Karlovac. They have a large local brewery and a castle, but it's mostly unmemorable. So impressed when I visited Plitvice Lakes in spring 2010 that I went back there with my then-girlfriend in summer the following year. Upon my first visit, I said if the US had Grand Canyon, Europe had Plitvice Lakes. But after seeing amazing photos of the park covered in snow in Google Images, I had been seeking a chance to go back there in winter, and the chance finally came this winter. Upon hearing that the park could be closed due to snow in winter, I decided to stay overnight at the park to increase my chance of entering the park and booked an inn about 2 km south of Entrance 2. I thought I could easily walk for 2 km. I took an 8:30 bus from Split and after a long but somewhat scenic ride, during which it started snowing as the bus went into mountains, arrived at the park about 13:00. To my surprise, Entrance 2, the only entrance I used in my previous visits, was closed, and the bus kept going north for another 4 km to Entrance 1, meaning I was now 6 km away from my inn. Entrance 1 was open and was selling tickets until 14:00. The price of ticket was reduced by half because only a half of the park was open. I walked on a loop that took me about 90 min. Somebody told me that it only started snowing a few days before in the area, so I have to consider myself lucky to see the snow-covered park in its absolute gorgeousness and gorgeousity. I was expecting water falls to be frozen, but that was not the case. After the walk I stopped at a café that was open at Entrance 1 and was packed. 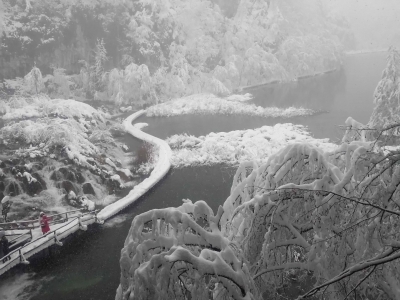 It seemed like every single tourist stopped there after hiking in the falling snow. A hot cup of cappuccino consoled me greatly. But now what? I was still 6 km away from my inn. The info office at Entrance 1 told me there was no more bus going south that day. They actually called my inn to see if they would come to pick me up, but only kids were home when they called. The taxi ride would cost 10 Euros. Well, it was still about 15:30 and bright outside, and I had nothing more planned that day, so I decided to walk with my convertible wheeled luggage. It was difficult to pull the wheeled luggage on the snow-covered road, so I put the luggage on my back near Entrance 2, which I should have done from the beginning. I arrived at my inn about 17:00. Luckily a decent pizzeria nearby was open for dinner. The following morning, I took a bus at a bus stop only about 100 m from my inn at 6:50 to Karlovac on my way to my next destination, Porec, Croatia. If you intend to visit Plitvice Lakes once, I would recommend doing so in spring, as water from melting snow creates a lot of water falls, and you can see the entire park in its full glory. When I visited there in summer, the water falls were noticeably less. It was also so hot that it was difficult to resist the urge to jump into the alluring blue water right under my feet with crippling amount of calcium. If you visit one more time, I would strongly recommend winter. I can’t speak for autumn, but as far as I can see in Google Images, it also looks amazing then, so I would love to go back there in autumn when a chance comes. As far as Grand Canyon goes, I believe it's more beautiful in winter than in any other seasons. This is my first review on this website so it seemed logical to start with my first (knowingly) visit of a WHS. I still rank it as one of the best I have ever been. It's a site with a real "Wow-factor". At least it was for me. Since than I've been looking for more. We made the trip in september 2010 from a holidayresort in the town of Pula. It’s about a 2 hour drive from there to Plitvice. A tour still vivid in our memory because of the route TomTom told us to drive. Along the tourist coastline the roads are perfectly fine but we found out that the same couldn't be said about the small paths leading through lovely burt down, war-torn villages a bit further in land. It was 15 years after the war but it seemed there was still a lot of repairwork to do. It made us quiet for a while but that soon changed when we were in the park. Plitvice with its wonderful lakes and waterfalls is fantastic! I remember how surprised we were to see such an unspoiled piece of nature. We would have expected this on a far, far away island in the deep ocean but not in (our) industrialized Europe. Being raised in the city we had a very limited worldview I quess. We were brought up the hill by a shuttle bus and as soon as we were dropped off we started admiring the landscape in awe. Crystal clear water was running down the hill in a lush green environment. In the magical blue and green coloured lakes plenty of trout was swimming. It was like a fairytale and we were constantly looking around trying to spot a fairy or troll. If these fantasy creatures do exist, we figured, this would be the place where they would be living. All in all we spent a very pleasant day in the park and, on the way back to our car, we were complimenting ourselves that we had finally done something usefull. Instead of yet another day at the beach we had enriched ourselves with something special. A natural wonder. A WHS. We agreed to this more often and with that satisfying smile on our faces we started the car. It was the end of our beautiful day. Whatever we tried the car refused to do what it was supposed to do. Not the best of moments in a fast darker getting forest with nobody around. On top of that we found out that our phones were nearly empty. "and honey, where did you leave the telephone number of the carhelp? Me, I thought you had it!" I will spare you the rest but till this day it is one of those stories which comes up every now and than. We did make it back though. Thrilled of the adventures we experienced we started to look for more sites to visit. It was the start of a long quest. Read more from ech wel here. I visited this great natural WHS in April 2014. I spent 3 days here and it was worth it to have more time to visit at leisure. The entrance to the national park costs 14.50e (if you stay at one of the hotels inside the park this entrance fee will be valid for all your stay) allowing you to use the boat trips from one side to the other of the largest lake or else use the electic vehicles that take you from one entrance to the other. I didn't use the latter since I had ample time and decided to hike instead. The trails are really pretty and allow you to observe the abundant flora and fauna of the park. There are ladders that are placed on puddles so that you can easily walk the trail without wetting your shoes. However, good hiking shoes would be advisable. I visited both the upper lakes and the lower lakes and both are extraordinary. However, if I had to choose one, I'd go for the lower lakes with the big waterfall (Veliki Slap) and the "walk on water trails". The highlights of my visit were the panoramic views from above the Sulpjara Cave and just opposite the big waterfall with all the rainbows. Plitvice Lakes National Park is definitely one of the best natural WHS I visited in Europe. The Plitvice Lakes National Park in the Dinaric Mountains is the largest and best known national park in Croatia. In total, the park comprises about 300 square kilometres, mostly primeval beech and fir forest, and is the refuge of bears, wolves and lynx. However, we've not seen any of these shy animals, except for the bear in the park logo. Like most tourists, we visited the area around the lakes, which is only a small part of the entire park. This landscape is called the "land of the falling lakes". At a length of 8 km, two larger and fourteen smaller lakes are lined up like pearls on a string. The lakes are connected by cascades and waterfalls and separated by natural barriers of travertine. It is a breathtakingly beautiful landscape: the water is crystal clear and shimmers blue and turquoise, beeches grow close to the shore, and everywhere is lush greenery. We started our tour at the southern park entrance, which lies midway between the upper and lower lakes. 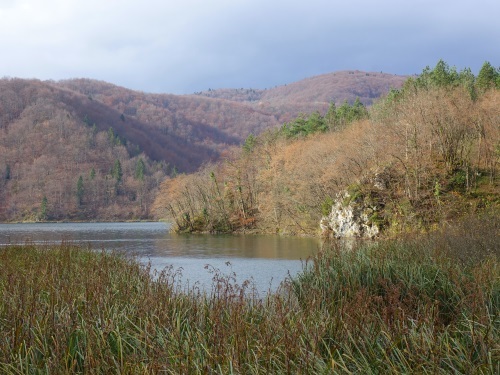 First, we hiked north along the eastern shore of the largest lake (Kozjak jezero). The area of the four lower lakes are in a canyon-like landscape, our guide book described it as the most beautiful part of the park. The trail leads uphill along the ridge of the canyon to the big waterfall (Veliki slap) with a height of 78 metres. We had wonderful views of the lower lakes (photo) and the northern part of the park. Then we walked down to the bottom of the canyon. The trail back leads close along the lakeside, we walked on wooden footbridges and well paved paths. The second part of our tour led south along numerous small lakes and pools to the upper large lake. We came past countless watercourses, cascades and waterfalls, it's an awesome scenery. There are trails on both shores and footbridges inbetween. Often, we walked back and took an alternative route in order to capture all beautiful views and scenic details. Most notable is the Galovac waterfall with 25 metres in height. I liked this middle section even better than the first part of our tour. The last of the upper lakes (Proscansko jezero) is less attractive, also beautiful, but it looked like many other mountain lakes I've visited before. So we did not continue our hike along the lakeside, in favour of a delicious picnic. In total, we spent the whole day in the park. It was a warm, sunny weekday in June 2006, perfect for our tour, the park was not too busy. Most guide books recommend not to visit on weekends in summer, when the area around the lakes is very crowded. The park can easily be explored by foot, there is a network of hiking trails and wooden footbridges around the lakes. The height difference between the lowest and highest lake is 130 meters. Shuttle buses run between the upper lake and the entrances and there are also electric boats that take visitors from one end of the largest lake to the other. We stayed at the Hotel Jezero, one of the three hotels near the southern park entrance. The décor and atmosphere had the charm of the 50's, quite pleasant. But the large dining room was not to our taste. We preferred one of the taverns along the National Road, where we enjoyed a barbecue with suckling pig. In Croatia, they seem to have a passion for barbecue, not the best place for vegetarians. 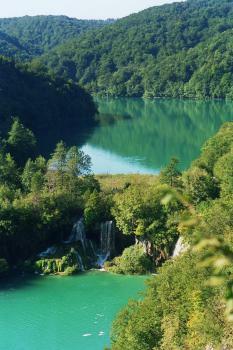 The Plitvice Lakes are at the National Road D1 and can easily be reached by car. There are also buses from Zadar (about 150 km). The lakes are definitely worth a visit, even for people who are generally not fans of natural WHS. These lakes in central Croatia are justly famous for their natural beauty and wildlife. A classic karst landscape, the lakes are separated by dams and waterfalls. You can walk among the lakes on relatively narrow and slippery wooden trails. The area is really beautiful, unfortunately, when I visited there, it was cold and pouring (and it was mid-June). So maybe I'll get the chance to visit the lakes again in better weather sometime in the future. My first trip to Croatia, and my friend Domenic took me to Plitvicka. We spend the night in his van in Slunj, where I got a bit of a preview of the area. My knowledge about the park was zero when I arrived and I was in for a big surprise. People say "it is the most beuatiful area in the whole of Kroatia", and afterwards I admit had to agree, eventhough I did not see the rest of the country. Now I look out to seeing the movie of Winnetoe and the treasure of the Silver lake, just to get a bit back of that one wonderful day I spent there; saturday 10 June 2006, a great day, thanks a lot; Dado, Maja and Bagi! I arrived by bicyle, bus and train to the park with the help of a pretty moslem woman and her french speaking Swiss girlfriend. We met while sitting at an isolated woodside intersection, while waiting for the local bus. The park is deeply shaded and wild in appearance. Most board walk trails are not signed in english. It takes a good 5 to 8 hours to view/travel the main riparian paths. there is a short boat trip involved. Walking is easy and cool. The region is a very safe one for travelers. Hotels are full service and expenses are low to moderate. Late Pleistocene: During ten to twenty thousand years, in the latitudinally running faults some ten to twenty barriers have been created; they divided the Korana riverbed and closed from the north the lake basins created this way. 259 Community Members have visited.